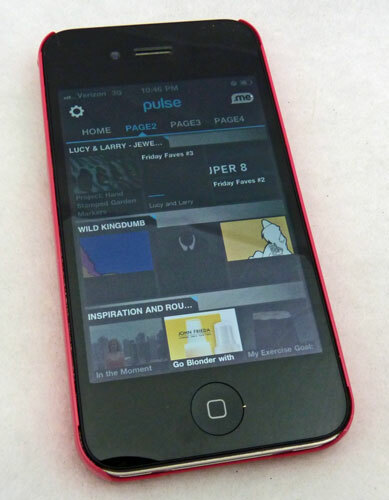 I've been searching for an app for my iPhone to help me stay on top of my favorite blogs, and I finally found it with Pulse. I was able to load in all my favorites- it syncs up with Google Reader- and now I have all this great reading material right at my fingertips. It's so great when you have a few minutes to kill, whether it's waiting for an appointment, during a commercial break (I multitask), or sitting at a red light (OK, totally kidding about that last one). You can keep your blogs in different categories that make sense to you. Each blog pans across the screen with a square for each post. When you tap on the post, it will first show you a simplified text-based version, but if you tap on it again, it will take you directly to the source. It grays out once you've read it so you can easily tell what you still need to look at. If you read as many blogs as I do, you NEED this app (and oh, by the way, it's free!). Check out my tutorial on how to make these! Monkeys Always Look: First of all, awesome shop name, right? You can also order a set of custom garden markers for the plants of your choosing! Beach House Living: Looking for wedding ideas? You could also use stamped spoons as place cards, table numbers, or other wedding favors and decor. I had to share one more item from Beach House Living for all you ice cream fans. Jessica N Designs: Speaking of weddings, I love this personalized wedding cake server! Also, fun idea for a baby gift. Sycamore Hill: For your coffee! This spoon is one of my all-time favorites. Hope you all have a wonderful weekend and Happy 4th of July!